We accept all returns to the store within 90 days of purchase in the form of store credit or product exchange. We do not give money back. My product stopped working, Can I return it? All products purchased from America's Factory Outlet are covered under our 90-day warranty to repair or replace your product. We do not give money back, rather we will gladly fix the item for you or swap it out for a new working one. I want to exchange a product, but I've lost my receipt. As long as we can look up your order in our system, then we can process an exchange. If your transaction is not in our system, then we cannot exchange your item. Can you deliver large appliances purchased at your store? We currently do not offer delivery services, you will be responsible for handling the delivery process of your newly purchased appliances. We finance our items from Acima, you can apply directly through here. How does financing work with Acima? If you have those for requirements, then you are approved! Apply now, there is no credit needed! You will receive your decision instantly! Can you hold an item for me until I can purchase it? We cannot hold any items at the store. If you can't come to the store, you can always call and pay over the phone. After I purchase an item, can you hold it until I figure out how to take it home? After you have purchased an item we will gladly hold it for you for up to a week until you can arrange a delivery method for your item. 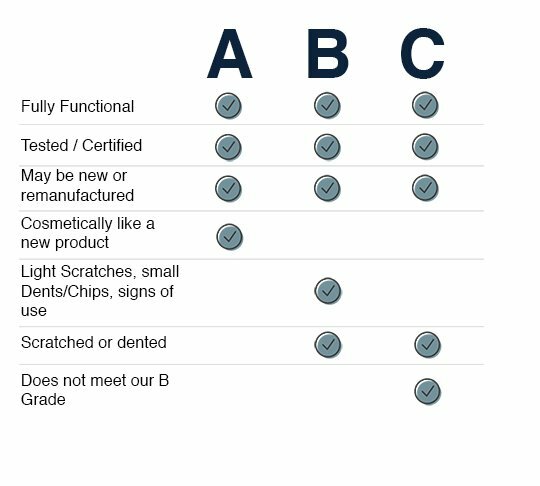 What classifies a product as grade A, B, or C? Refurbished products are those which have been returned unused, or returned due to a manufacturing defect. Those returned products are then tested, repaired, and quality inspected prior to resale. What is a remanufactured product? Remanufactured products adhere to the ANSI RIC001.1-2016: Specifications for the Process of Remanufacturing. These products are rebuilt using the specifications of the original manufactured product. These items may contain new or used components and are quality inspected prior to resale.